Miami Beach 411 : Restaurants : Shula's : Search reults for steak restaurant on Collins Ave. in Miami Beach, FL. This page allows you to find Menus, Customer Reviews and Online Reservations for Shula's in Miami Beach. Click HERE for Shula's Online Reservations. Bring your Visitor Pass and save 10%. Learn more. New York Strip, 16 oz. Kansas City Strip, 20 oz. Lamb Loin Chops, 22 oz. French Cut Chicken Breast, 16 oz. Shula's is located at 5225 Collins Ave. in Miami Beach FL, 33139. Nearby restaurants include: Outback Steakhouse, Talula, and Yeung's. Use our Miami restaurant map to find the exact location. 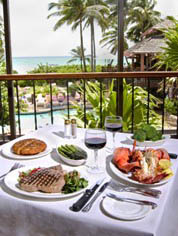 Shula's "Great food and ambiance with ocean view"
I live in Miami Beach and go to Shula's often. It has consistently attentive service and an upscale, clubby atmosphere. They don't lay on the football theme too thickly - even my wife thought it was a beautiful restaurant. The portions are almost too large, so be careful to share the side dishes, which are huge. Go for lunch and have a great ocean view during the day. Ask for table # 8 by the window. Good martinis and bar food in the "No Name Bar". Shula's "Excellent service and great food made our night "
My family and I were extremely impressed not only with the food quality, atmosphere, but the service we received from Jorge, one of the servers that was working there with his Teammate Andre. The atmosphere is great, the food excellent but the service we received from Jorge and Andre exceeded all of that. I could not believe that those two guys were working at Shulas as Server; they are great human being and made our dinner an splendid evening. Thank You guys, keep up the good work because You will reach your goals soon. God Bless You! The staff and the location are excellent. Great steaks in Shula's, on property Steakhouse. Great value with full suites featuring kitchens, 2 baths, balcony, multiple room configurations. Perfect for the vacationing family. Use this eform to submit a reservation request to Shula's . Before using this system, please read our reservation guidelines. Shula's in Miami Beach's Dining Guide.